The easy way to keep your playground, school or kindergarten sun-protected. 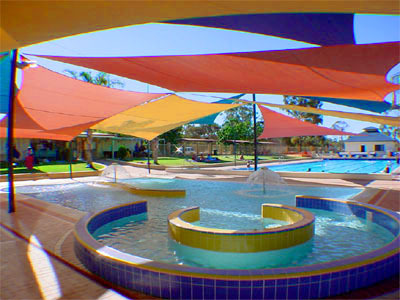 Melbourne Shade Sails™ is a quality supplier that offers you the best design and construction in all different shapes and sizes of shade sails, so that no matter what you need, you’re sure to find the right product here. Shade sails are beneficial for any outdoor commercial area that needs safeguarding against sun, wind and rain. No matter what time of day it is or how extreme the heat, UV inhibitors prevent harmful rays from penetrating the fabric, offering up to 98% protection. This means the ultimate protection against sun damage to the skin, such as sunburn and skin cancer, so that you can enjoy the outdoors all year round. Breathable fabrics allow fresh air to circulate beneath the shelter of your shade sail, providing you with a comfortable, cool and well ventilated space ideal for hot summer days. With a range of sizes and shapes from large square sails to pointed triangular options, you are certain to find exactly what you need for your commercial space. After you’ve chosen the right shade sail for your needs, it’s time to think about installation. By making sure you’ve set everything up properly to begin with your shade sail will be much more effective and you’ll have less need for maintenance later on. But if you don’t have time to worry about installing your shade sail, or don’t like the idea of fussing about with ropes and posts, there’s an easy and affordable solution. We install your new shade sail for you quickly and efficiently, giving your play area, sports ground or school yard the best sun and rain protection possible. Fast and professional installation service is available in all suburbs across Melbourne. With our expert construction your shade sail is sure to be stable and properly set up, providing maximum safety and protection. We show up on time and get the job done fast, because we know you’ve got more important things to do than sit around waiting. All our trained installation staff members are experienced with shade sails and are dedicated to providing the safest and most stable construction possible. Our installation fees are lower than competing suppliers, because we care about helping you. Not only that, but we throw in a free consultation, measure and quote on all jobs. Melbourne Shade Sails™ is here to help. Install your commercial shade sail properly and efficiently and enjoy the benefits.